When I was younger, I went through a phase of wanting to celebrate my favorite stars’ birthdays by watching their movies. 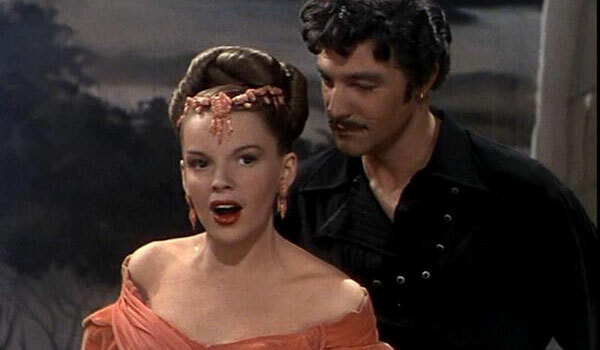 The only one I managed to very successfully was Judy Garland, whose birthday on June 10th I celebrated with marathon viewings several years in a row. To this day, June 10th never comes around with me thinking of Judy, one of the greatest entertainers of all time. At this point, I’ve seen all but a handful of her films, so let’s use Flickchart to see what my favorites are. Flickchart is a movie ranking website that pits two random films against each other and asks you to choose which one is better, meanwhile building a list of your favorite films. I rank according to what I like the best, prioritizing personal preferences and emotional connections, so my Flickchart is in no way meant to be objective. In the 1940s, several of the studios had such impressive arrays of talent under contract that they liked to do films that basically just showcased them all. Musicals were great ways to do this, since they could just cram in musical numbers featuring different people. Ostensibly a recreation of the Follies of Broadway fame, and starring William Powell reprising his role as Ziegfeld from 1936’s The Great Ziegfeld in a very thin frame device, this is really just a series of sketches and musical numbers with no connecting material whatsoever. It’s a revue, pure and simple, something that never really caught on in film, despite a few attempts in the late 1920s. So calling this “a Judy Garland film” is a bit of a stretch, since she appears in one sketch and that’s it. But she’s pretty hilarious in it, and I do enjoy the movie as a whole, which is a pretty great excuse for a lot of solid singing and dancing, and some fair to middling comedy. Garland’s bit is “A Great Lady Gives an Interview,” a pastiche on an actress who thinks she’s all that (the role was apparently supposed to go to Greer Garson in a bit of self-parody, but I guess it hit a little too close to home and she refused to do it). It’s over the top, but Garland seems to be having a ball with it. I have this much higher on my list than it appears on Flickchart’s global list (where it’s near the bottom of Garland’s filmography), partially because it’s not that well known and I doubt many Flickcharters have seen it, but it also seems to be relatively maligned even among classic movie fans. I remember looking it up in Leonard Maltin’s guide (I did that for almost everything I watched back then), and being severely disappointed that he gave it ** stars, or maybe even *1/2. I even remember the gist of the one-line review: “Well, there she is, and there the movie festers.” Okay, so it ain’t a masterpiece. But it’s one of Garland’s first adult roles, and she’s fresh-faced and delightful as the title character dogging Van Heflin’s producer to try to get a job on Broadway. Along the way are numbers like “Tom, Tom the Piper’s Son” showcase not only Judy’s magnificent pipes, but her burgeoning talent as a comedienne as well. This highly underrated movie was something of a flop when first released; you can kind of see why, as its story of a young girl infatuated with tales of the pirate Mack the Black and a circus performer who gets mistaken for said pirate is a bit all over the place, and the musical numbers fall toward the overly frenzied. This is a fever dream of a movie in a time period that was used to far less outre entertainment. Today parts of the film might fall under the classification of camp, as in Judy’s wild performance of “Mack the Black” (in the film, she’s under the power of hypnosis and revealing her innermost passions), while others are simply fantastically silly, like Gene Kelly being outdanced by the Nicholas Brothers in Cole Porter’s “Be a Clown.” Supporting turns from the always dependable Mildred Natwick and Walter Slezak don’t hurt, either. 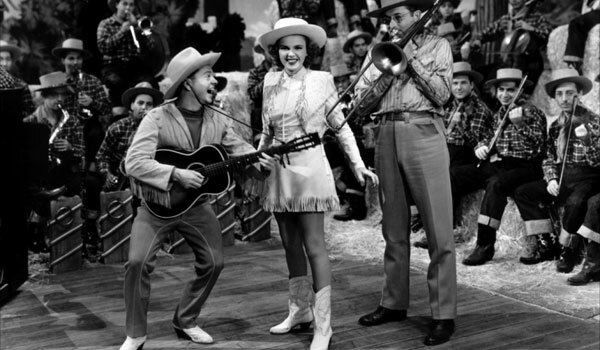 Judy made ten films with Mickey Rooney, making them one of the most prolific teams in Golden Age Hollywood. A lot of them were basically as kids, though – they might or might not be each others’ love interest, but for most of their films, any “love” was teenage puppy love. Their last film as actual costars was Girl Crazy in 1943 (1948’s Words and Music had Judy playing herself as a musical guest and performing a song with Rooney’s Lorenz Hart), and it’s the only one of their films that could really be considered a grown-up romance. With some of the best songs Gershwin ever wrote, including “Embraceable You” and “But Not for Me,” this is the one Rooney-Garland picture you really oughta see. Add in a western setting with Rooney as an Eastern greenhorn trying to master ranch life to impress Garland, and it hits most of my favorite movie things all in one fell swoop. It’s unfortunate that the movie cut out a number of great songs from the show, but what’s left sounds great coming from Judy. Plus, look for June Allyson’s screen debut as one of the girls in New York. Did I mention I love westerns? Because I do. 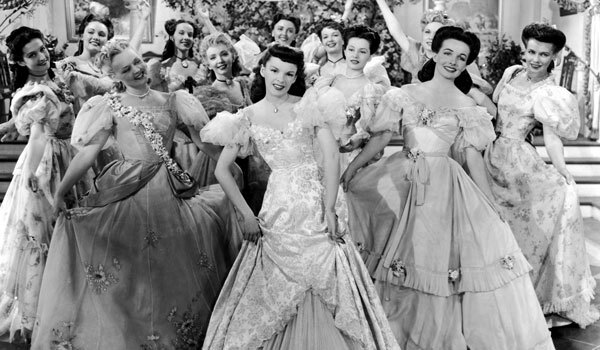 The Harvey Girls is notable in the annals of Oscar history for winning Best Song – the extended ensemble number “On the Atchison, Topeka, and the Santa Fe” – but beyond that, it’s a pretty standard ’40s musical western. Except I happen to LOVE it. Judy is one of the titular girls, a bevy of women who traveled out west to work as waitresses for the Harvey restaurants, which popped up wherever the train went through a town. According to the film, they act as a civilizing influence on the wild west, which pits the Harvey girls (led by Judy) against the saloon dancers (led by a young and sultry Angela Lansbury) and the saloon owner, who – surprise, surprise – Judy falls for. He’s the weak link in the film as far as I’m concerned; John Hodiak is just kind of there on-screen, and can’t hold his own with Garland, Lansbury, Ray Bolger, Virginia O’Brien, and others around. A young Cyd Charisse is on tap, too, but isn’t given very much to do. A sleeper film if ever I saw one, and a film I recommend to most everybody when I get the chance. 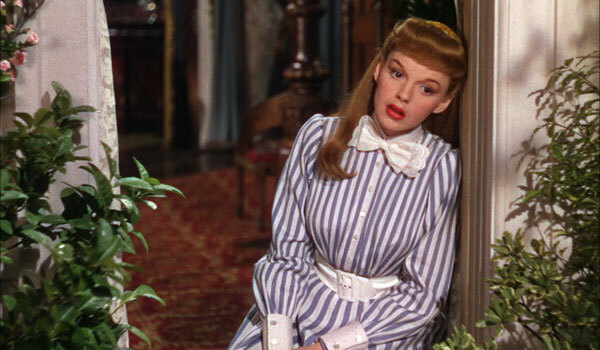 It’s the first of only two or three purely dramatic roles Judy ever played, with nary a song in sight. It’s a very sweet wartime love story, with Robert Walker a GI on leave who meets Garland and they instantly fall in love and decide to get married before he has to return to his unit the following day. The majority of the film follows their attempts to get a marriage license and rouse a justice of the peace in the middle of the night. Now, I usually find “love at first sight” stories to be irritatingly unrealistic, but in classic films it often works, and it works really well here. Both Walker and Garland sell it, and the film is simply charming from start to finish. It’s definitely a great one to remind us that although Judy is appropriately recognized for her voice, she’s also a capable dramatic actress when called upon. 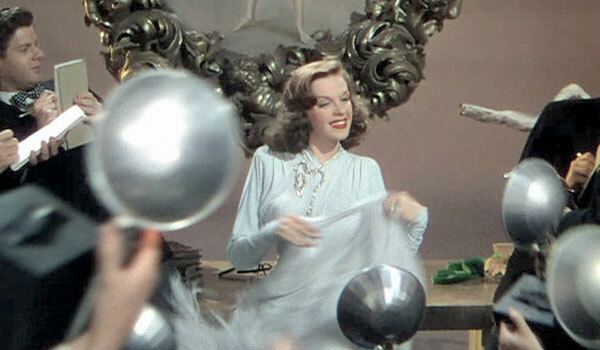 We can thank the film’s director, her then-husband Vincente Minnelli, for giving her the opportunity. I’d say Judy has three signature roles, and this is one of them. Meet Me in St. Louis is the height of Americana, capitalizing on war-era nostalgia for the perceived simpler times of the turn of the century. This film has always been close to me because I’m from St. Louis originally, and a lot of the World’s Fair structures are still there (the film doesn’t actually show any of them, of course, being shot all on MGM’s backlot). That said, I never really liked the Tootie subplots when I was younger, even though you’d think I would, and even though I appreciate them more now, I still think the Halloween scene especially adds a decidedly weird turn to the film that doesn’t quite sit well with me. 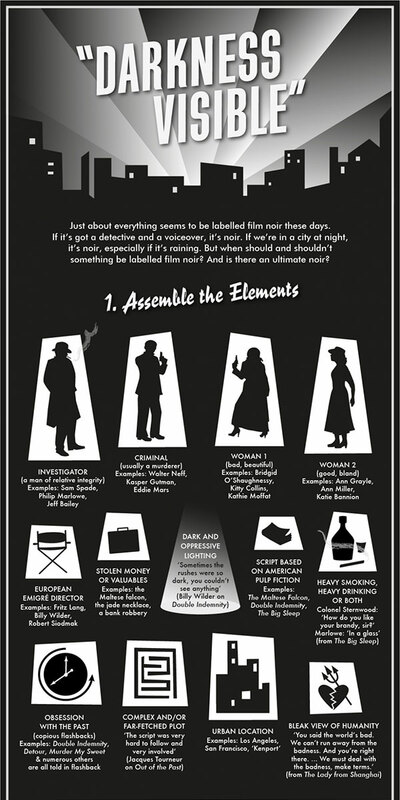 But that’s merely why it’s fourth instead of second or third on this list, because the rest of the film is delightful, from Judy’s girl next door dreaming about “The Boy Next Door” to older sister Lucille Bremer trying desperately to get a call on the newfangled telephone device. Maybe most people would put Meet Me in St. Louis above Easter Parade, and I wouldn’t fault them for doing so, but I just find this movie delightful from beginning to end. 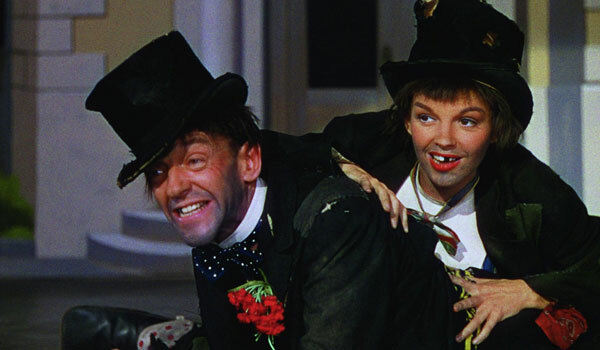 Fred Astaire returned to the screen from a brief retirement when Gene Kelly pulled out of the picture due to injury (and good thing he did, too – several of Astaire’s most memorable films came after this one! ), playing a dancer who swears he can turn anyone into a great dance partner when his partner Ann Miller leaves him – even an apparent klutz like Garland, a rather clumsy chorus girl. He didn’t even realize at the time what a singer he had on his hands, and of course, they turn out to be the perfect entertainers. Great catalog songs from Irving Berlin, with great musical performances from all three of the main cast (and a surprisingly charming if reedy number from Peter Lawford) makes this one a keeper. 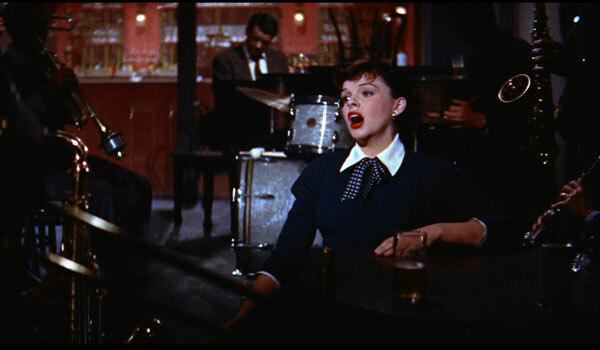 Judy’s “comeback” film after four years off-screen, and boy does she ever come back in this well-worn story of a young wanna-be entertainer who gets her chance at stardom after falling for an actor in a downward spiral of alcoholism. There’s a lot of serious stuff in this story, giving Judy and James Mason a good chance to stretch their acting chops. And she does – her final speech is one of the greatest scenes in film. But of course where she really kills it are the musical numbers added for this version – her jam session “Man That Got Away” that goes from casual to heartbreaking in four minutes, the extended origin story told in the “Born in a Trunk” montage, and more. And the general Flickchart populace and I agree on this one. 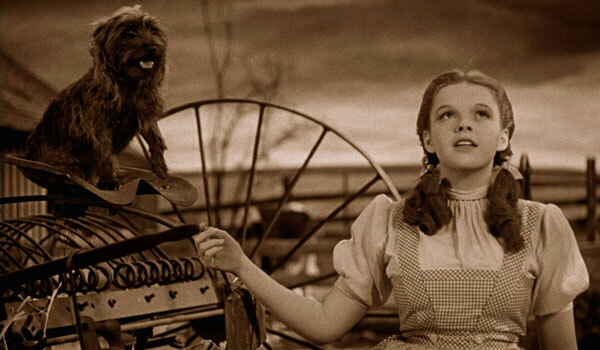 The Wizard of Oz is just about unbeatable for me, in any competition (no, really, it’s my #8 of all time). Everything about the film is rapturous, and even though Judy was already a seasoned film performer, this was really the one that made her a star. It’s kind of fitting, I think, that my #1 and #2 films capture her in what I’d consider her signature roles as a youngster and as a mature performer. She was the ultimate entertainer, and these two films are the ultimate testimonies to her talent and perseverance. “Presenting Lily Mars” but no “I Could Go On Singing”??!! I can see the point of all your other choices, but….. NO to “I Could Go On Singing”??!!!!!!! It didn’t even appear on your list at all. For shaaaame! I Could Go On Singing is one of probably three or four Garland films I actually haven’t seen. I’ll have to bump it up my to-watch list! You won’t be sorry when you do watch it. It’s a terrific movie, and maybe the best acting that Judy ever did. 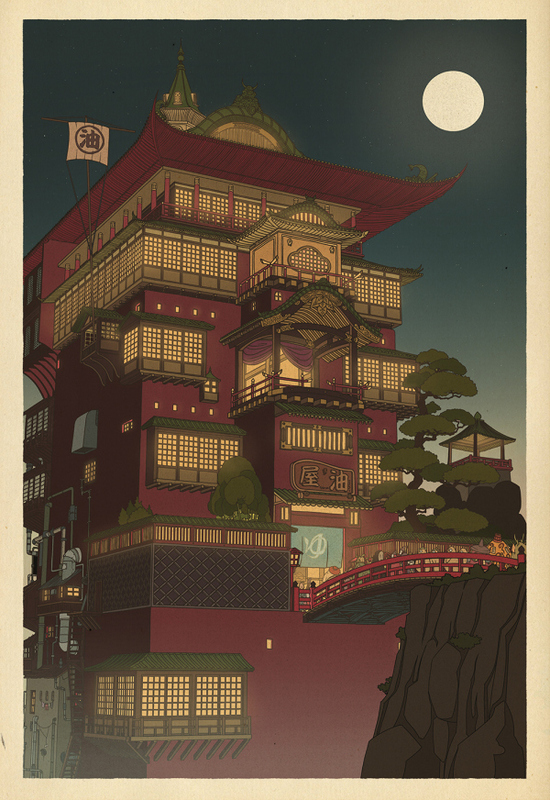 At the time of its release, it didn’t get very good reviews…. I think that critics were put off by the fact that she was clearly getting into middle age, and also the fact that it wasn’t anything like the old MGM-style Judy. This was a serious, adult drama with musical numbers like “A Star is Born”…. but definitely not a lightweight musical comedy. She was so good in it, though; and the movie comes off better today than it did then, I think. The hospital scene towards the end was written by Dirk Bogarde, with considerable input by Judy herself— and her acting is so raw and real that you HAVE to think she was playing herself at this point and trying to communicate what it was like being Judy Garland. Spine chilling. If you look closely during the boat scene where she and her “son” are taking a tour down the river— you can see Judy’s real life children Lorna and Joe among the passengers. Definitely a must-see! No “For Me and My Gal”? Although I do like your other choices. You know, I have seen For Me and My Gal, but it’s been quite a while. I remember liking it well enough but it didn’t stick with me. Maybe I’ll give it another watch one of these days. Thanks for the suggestion! Hi, thanks for the comment! For Me and My Gal is a favorite for a lot of people, I know. It’s not that high on my list, but it’s been a while since I saw it. Maybe I’d like it better now!